The strength of a good summer camp comes from its staff, and we mean the seasonal summer camp staff. They have the most important jobs in camp. The summer staff position requires many different roles be fulfilled: role model, friend, disciplinarian, comedian and referee to name a few. Our staff creates a fun atmosphere within a carefully controlled and tightly monitored environment that encourages campers to grow and develop. All staff members must be committed - to listen to a story, hear a joke or respond to a concern. They must feel comfortable giving a hug, maintaining order and offering words of encouragement. Most important, they must always serve as positive role models. Hiring staff is the most important part of summer camp! How do I become a member of the camp staff and what do I need to know? Click here to start the process and learn what it takes to the join our team. 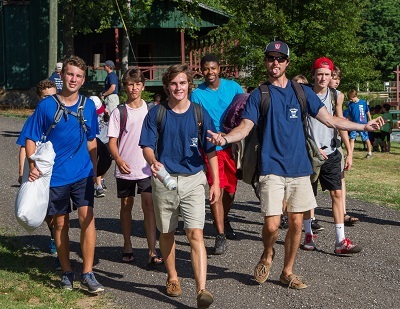 Now Hiring: Boys and Girls camp staff - apply today. All staff must have the following forms completed and on file before they can begin their employment with us.